Living in windy Birmingham I quickly learned that my umbrella management skills were inadequate. The high turn-over of umbrellas was too burdensome for my student income. I started wearing hats, getting wet. 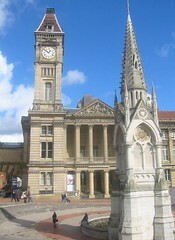 Specifically the fountain infront of Birmingham museum and art gallery. A summer night in a fountain, a wonderful temporary innoculation againt the pain of a lost heart. A fountain and The Blue Nile’s album ‘A walk across the rooftops’ took me to the places I needed to be. When they later released ‘Hats’, naturally I was thrilled by their unknowingly knowing insight. This scribble was published on Monday, July 13th, 2009. You can follow any banter on this scribble with the RSS 2.0 feed. You can share your inspired musings after typing the anti spam word near the bottom of the page. But no Pinging because its too naughty.